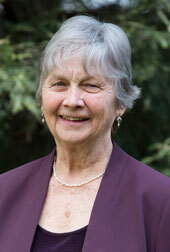 Margaret Simpson has been following the Siddha Yoga path for over thirty years. She offers seva as a Siddha Yoga meditation teacher. She also serves as a writer and editor—both from home and as a visiting sevite—in the SYDA Foundation Content Department. Margaret is the author of A Perfect Life, a biography of Baba Muktananda for young people, and was a regular contributor to and occasional guest editor of Darshan magazine. She hosted a Siddha Yoga chanting and meditation group in her home in Laurieston, Scotland from 1994 to 1997, and in Bath, England from 2003 to 2013. Margaret is a professional writer with novels, books on history, and television scripts to her credit. She currently lives in Wiltshire, England. This beautifully told “Mandala of Love” went to the heart of my experience of the sadhana of the Guru-disciple relationship. Years ago, whenever I was in Gurumayi's presence, I longed to be special. And even now, whenever I'm with other people, I often long to feel unique or stand out or be recognized. Recently in a yoga class, when the teacher asked us to make an intention, I reflected on this and said in my heart, "Let everyone in this class experience the same bliss." It was pure heaven! I felt lighter, more forgiving, and more open in such subtle ways. One of my favorite things on this amazing path is that, whenever I am so fortunate as to wake up to a true understanding, at that very moment Gurumayi is right there with me. I am deeply grateful. Such a profound teaching told so enchantingly! The story so clearly demonstrates to me that the moment we get carried away with our ego, we disconnect from our divine nature, our true Self. I have been delighting in reading and contemplating this beautiful story of selfless love and devotion. Every day I read just one chapter, the better to savor it. And every day I am given a reminder of the profound love in my heart. Today I came to the end, but will start from the beginning again tomorrow. I was moved by this story. It captured the essence of what it is to walk a spiritual path of devotion, discipleship, service, and love. For me, what happened to Radha and the gopis reflects so clearly the primary challenge that arises in the mind of one who walks the path of love. It shows the way through that challenge back into the heart, and paints an inspiring picture of the reward for making it through—the state of all-pervasive divine love filling up one’s being. This challenge and reward have been delicately balanced all through my Siddha Yoga studentship—a balance I recognize as continually playing itself out through my own life and sadhana. I am so grateful for this path. This is such a beautiful story, embodying the profound message that the love we are seeking outside us is right there within us, and that this love is the Lord. My heart is full of gratitude and bliss for this reminder of the sweet power of devotion! The magic and majesty of this ancient story, so beautifully told, reminds me that its truth is available to me, and to each of us, in every moment, everywhere, and for all time. I am reminded, once again, to simply attend and yield to the inner sound of Krishna’s flute, to the pure love it conveys, and follow it home to my heart of hearts, wherein the sweet Lord dwells. I feel suspended in the beauty of the night of Lord Krishna's revelation of his true nature to the gopis—a truly breathtaking experience. While reading this, I felt I was watching the story unfold right in front of my eyes. I could feel Krishna’s radiance, divinity, and beauty. I developed a longing to have his darshan too, so I started listening to the Krishna Gayatri mantra right after reading this series. And it sounded even more beautiful to me than before! I am grateful to be reminded of God’s ever-present grace and to remember that I only need to tap into it with a pure heart, just as the gopis did. I love this tale—so full of longing and devotion. Reading it has pulled me into my heart and into the awareness that God exists in all things, in all people, in all of nature, in my whole world. I feel especially heartened by the reminder that I can connect with God's love within me by loving each person and each thing present in my life, even challenges in my work. I can practice being present to each situation I encounter, recognizing God's presence, and giving the best of myself. As I read how the gopis began to experience Krishna in the trees, the flowers, the birds, and all that surrounded them, I recalled my time at Gurudev Siddha Peeth in the Pilgrimage to the Heart Retreat. I remembered how everything my eyes landed on, everything my heart witnessed, filled me with love and devotion for this path, for our Guru, for God within me and outside me. My heart teemed with such love that I felt it overflowed to all I encountered. The Guru's love, the Guru's grace, were there for me to share with others. As I read these beautiful chapters of the Rasalila, I smiled and cried tears of recognition and empathy for the gopis. I thought of the experiences I’ve had of elation, of profound connection with the Guru, often followed by wondering where those experiences that I’d hoped would last forever had gone. The story helped me see how my preoccupations had gotten in the way of maintaining my appreciation of those precious moments. As I thought about this, like the gopis, I became aware of deep longing to live in the experience of the Guru’s love. I feel more understanding and acceptance that only staying connected with my own heart can provide a truly happy ending for my own tale of longing. What a divine gift this beautiful retelling of Krishna’s dance is. It helps me remember God’s love within, the beauty of God all around, and our natural inclination to celebrate, support, and love each other. Krishna’s kind, gentle, wise, and playful nature is such a beautiful reminder to me to be kind. Where I live, tomorrow is the spring equinox. This fresh rendering of the ancient story reminds me to let my heart open wider in this new season.